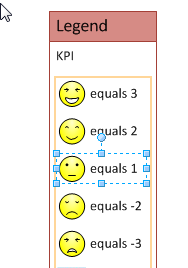 In my previous two articles, I described how to have 6 icons in a Data Graphic Icon Set, and provided some VBA code to make your own icons sets from existing Visio shapes or images. 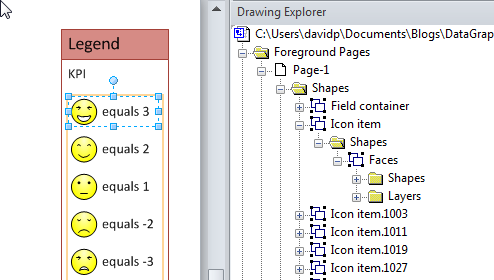 One thing that I overlooked was the Insert Legend command in Visio 2010, because it does not add the sixth icon automatically, so this blog describes how to add it. 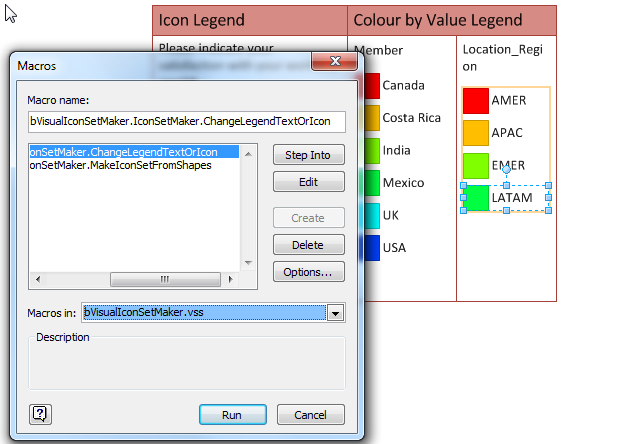 As a side effect, the code also enables the legend labels of icon and CBV (Color By Value) items to be edited. 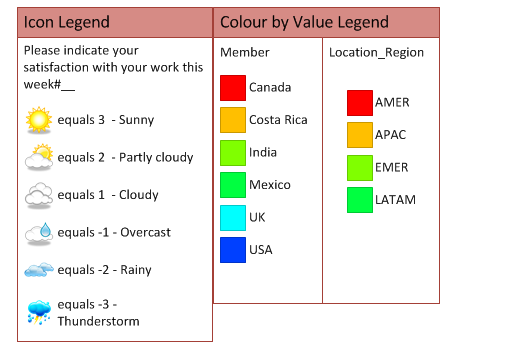 When you use the Insert Legend command, it examines the Data Graphics used on the active page, to create legends for each Icon Set or Color By Value settings that it finds. 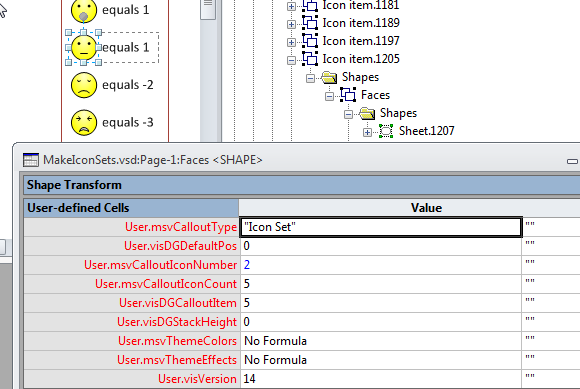 Closer examination of the legend shapes, shows that an instance of the Icon Set master shape is added for each of the icons found. So, my method for having a sixth icon as the default if a match is not found present a problem, because it is not displayed automatically. 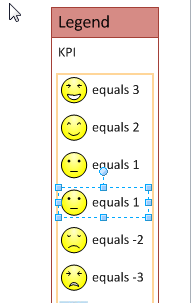 However, it is quite simple to add the sixth one. 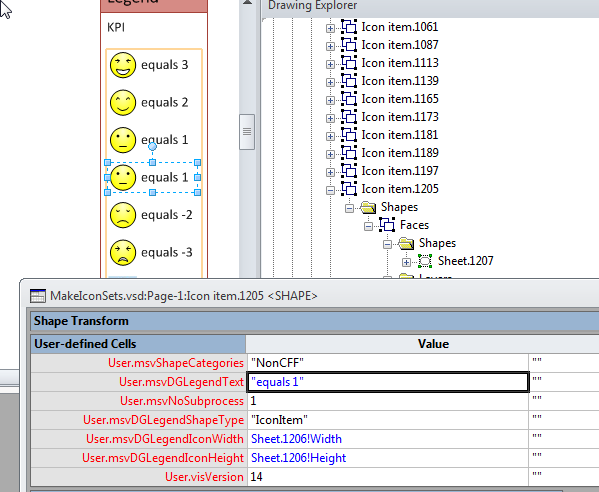 Select the icon above the one that is missing, then enter CTL+D to duplicate the shape, and notice that it will be added below it. 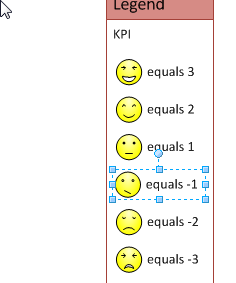 So, now there are two icons that look the same, and are both labelled the same. 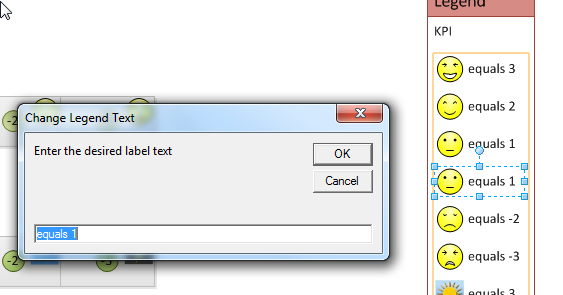 So, I decided to write a small macro to provide a simple way to display the default icon, and to change the text. 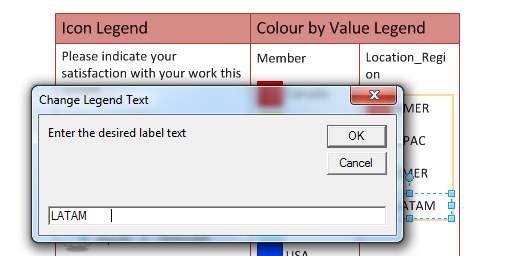 The label text is stored in the User.msvDGLegendText cell. 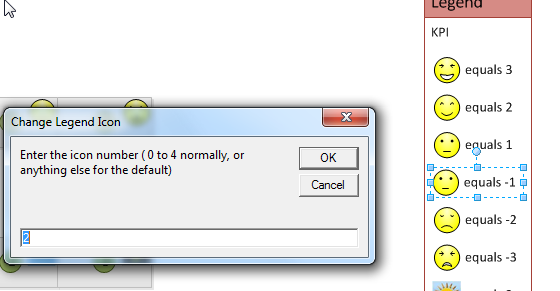 The displayed icon is controlled by the value in the User.msvCalloutIconNumber cell. shpLegendItem.Cells("User.msvDGLegendText").FormulaU = "=""" & txt & """"